14016 S Nestor Avenue, Compton, CA.| MLS# PW19081495 | Southern California Homes for Sale. Search properties Southern California. 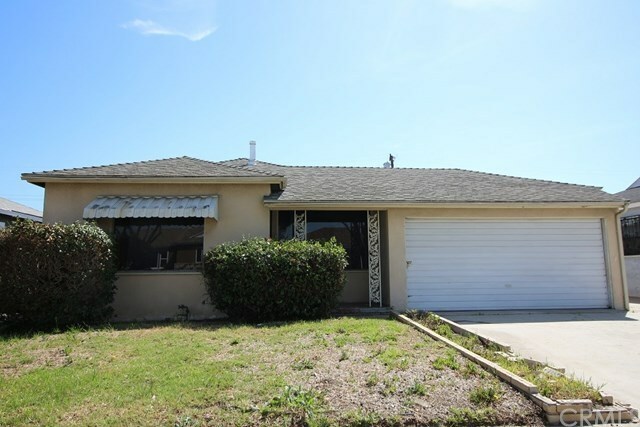 ***HUD Home in the RN area of Compton*** This spacious 3 bedroom/2 bath 1953 Contemporary style home is located in the Rosewood unincorporated area of Compton which means no city inspection and no 9A report! This special home features stucco exterior with concrete driveway to the 2-car attached garage. The covered front porch opens to a carpeted living room & adjacent dining area leading into kitchen with granite-like counter tops, tile floors, double stainless steel sink, garbage disposal, dishwasher, gas range & oven with vent hood & an open BAR that serves the adjacent FAMILY ROOM featuring double doors to the backyard & CLOSET â¦ easy to use as 4th BEDROOM! Off the family room is a cabinet-lined hallway/INSIDE LAUNDRY AREA leading into the MASTER BEDROOM with SEPARATE SIDE DOOR to the backyard, WALK-IN CLOSET & PRIVATE TILED FULL BATH! Off the living room is a hallway leading to bedrooms 1 & 2, and another FULL HALL BATH! This home features forced air heating system, composition shingle roofing & cinder-block fencing. Location is in close proximity of transportation, shopping, dining & entertainment & is within walking distance of all schools elementary thru high school. Available FHA203(k) financing allows you to add the cost of renovation/additions into your loan & work is completed after close of escrow! EXCLUSIVE Listing Period this property is available to OWNER-OCCUPANTS ONLY â with no competition from investors! HURRY â THIS WILL NOT LAST LONG! Directions: From the 91 exit Central and head North; make a right (East) on E 142nd St; make a left (North) on Nestor; arrive at the subject on your right.